The syllabus consists of weekly readings, accompanied by captured video discussions of the assigned poems between the instructor and a group of insightful teaching assistants, and online discussion forums (there’s also a course Facebook page and a wiki site). There are also some assignments – short quizzes (designed for the learner to check their own understanding) and writing assignments. The first short essay (writing assignment) is a close read of an Emily Dickinson poem (haven’t attempted it yet). 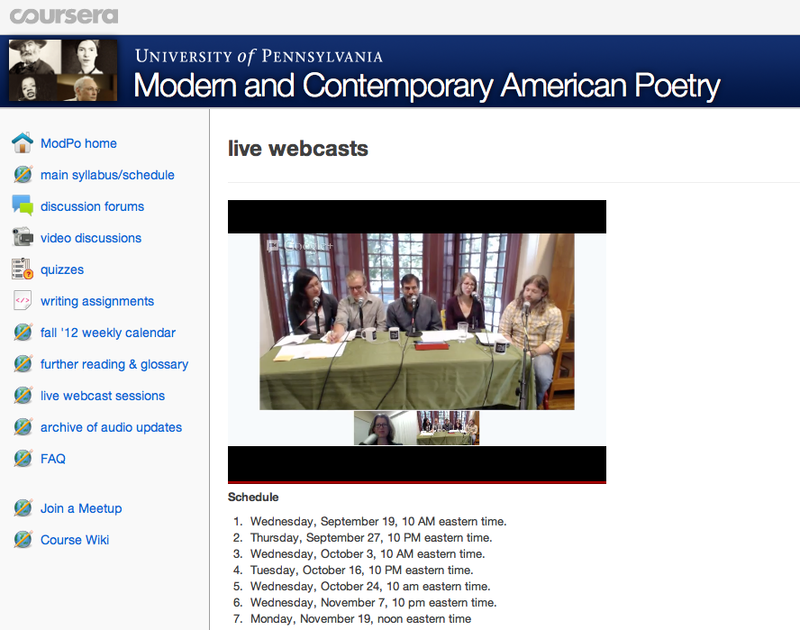 This morning, I participated in the first ModPo live session. The organizers embedded a Google Hangout widget in the ModPo course page, so we could watch and listen to the one-hour live panel right on the page (no downloads or complicated connections). The live session camera was trained on a panel of five – Al Filreis and four of his graduate students, with all of the rest of us (569!) watching, listening, and chiming in with questions/comments. Questions from the group came through Twitter (#modpolive), the course discussion forums, and by telephone (they announced a phone number at the beginning and many ModPo students called in, which lent a surprisingly old-fashioned feel to the affair). It was their first time running the course webcast, and it felt a little chaotic, but certainly gave the course a sense of immediacy. 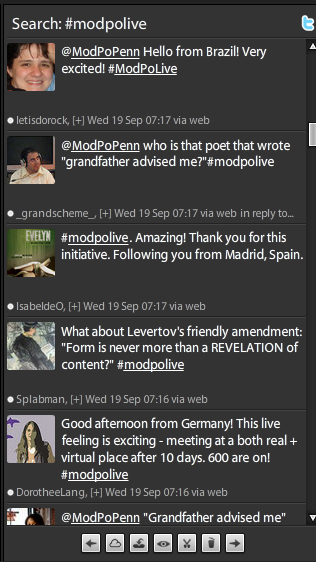 Fellow ModPo-ers were chiming in from all over the world (South Africa, Brazil, Europe, and all over the U.S.). It’s so clear that the course organizers have given this tremendous thought and invested hours of planning. Everything about the course feels well run, organized, and thoughtful. The web site is clean, simple, and easy to navigate. I’ve not yet had a technical problem that stood between me and the material, and Al Filreis’s enthusiasm and extraordinary interlocutor skills make it all work like a well oiled machine. Very impressive. During the webcast session, the crew took questions from the phone lines, from the Twitter feed, and from the Discussion groups. They played a poem read aloud (audio recordings), invited discussion, and commented on the week’s work. The discussions were wide ranging and completely interesting – connections to the movie “Grease” (you had to be here), of ars poetica (the “art” of poetry), the nature of “openness”, use of punctuation and pauses, and a tremendous amount of insight to the poems we’ve read so far. So, my impressions so far. I’m thoroughly enjoying the course. Despite a hectic schedule, and having just moved our home (! ), I’m managing to keep up with the course by devoting 40 minutes to an hour, each morning, to the readings and videos (a bit longer this morning with the webcast). The course videos basically capture a “close read” of the assigned poems and I find the discussions between Dr. Filreis and his graduate students fascinating. Line by line, they take the poems apart and analyze their meaning, their form, and the poem’s relationship to other poems we’ve read. I’m learning everyday – about poetry, about the connections between the poets, about poetic structure, and about the process of a “close read” of a poem (my friend, Karen, who is also taking the course, explains that this “close reading” is just one approach to the study of poetry). And speaking of my friend Karen, her participation in the course has made a huge difference for me. If I had a criticism of ModPo, it would be that it feels a bit too large, too impersonal. With 30,000 students enrolled, I can’t possibly keep up with the discussion forums, the Facebook page, and the Twitter feed. It feels like an avalanche of commentary and opinions (I made the mistake of subscribing to a thread when I commented on a discussion topic, early on – one hour later I had 70 emails in my inbox!). But when Karen and I, in our own “small group”, exchange ideas about the poems or the experience of the course, it feels real, solid, and personal. So far, I would dub this experience an absolute win. To me, this feels like technology applied to education at its best. A well-designed, content-rich course, that thoroughly mines (and leverages!) the unique affordances of the web. Well done. Of course, we have many weeks to go, so stay tuned for further impressions and lessons learned. As a coda to this post, here is a conversation recording between Al and the course’s lead teaching assistant, Julia, discussing the first live webcast, then going on to a wonderful metareading of a William Carlos Williams poem, “The Catholic Bells”. I’m also taking the course. It’s great. One of the best things is getting to know people from all over the world who are also interested in poetry. I’m really enjoying it. Thanks! cid said that to an elementary school kid when he was”doing poetry” in one of Chuck sandy’s classes… maybe about 4 years before he died. Cid most likely used this line many time when reading to kids… it got them involved in the fun of poetry. nothing much ever happens in a crowd… ever ! | Stepping Stones” on my very own web page. Go for it, Melba. I’d be honored. This is exactly the 2nd blog, of yours I personally checked out. But I personally love this one, “ModPo | Stepping Stones” http://rugz.